[prMac.com] New York, New York - Magzter, the world's largest digital magazine newsstand, adds another exciting edition of Forbes magazine to its catalogue. Magzter, which has been already digitally publishing several editions of Forbes magazine, namely, USA, India, South Africa, Indonesia, Thailand, Spain, Asia, Mexico, Centroamerica, Vietnam, Republica Dominicana, Russia, Turkiye, Brasil, Mongolia and Austria, has now brought on board Forbes Romania, which is a delightful news to Romanian-speaking readers all over the world. Published by BP Publishing Media, Forbes Romania has a right mix of 80% content from Romanian market and 20% content from international markets, thereby showcasing the overall business trends. The magazine looks at business as an essential part of life and publishes inspiring columns to encourage budding entrepreneurs to get into the next big league. "Forbes Romania is a dependable business guide that keeps its readers informed about the current business climate in Romania and also across the world. The magazine also publishes interviews of successful entrepreneurs, which motivate and lead youngsters to chase their dream business ideas. Here's wishing Forbes Romania great digital success on Magzter!" - Girish Ramdas, CEO, Magzter Inc.
"Magzter shares a great rapport with Forbes, one of the most renowned business magazine brands, and I am quite happy to welcome the Romanian arm of Forbes to Magzter. Similar to other editions, Forbes Romania also lives up to the legacy of Forbes with its authentic and well-researched reporting style." - Vijay Radhakrishnan, President, Magzter Inc.
Magzter - Digital Magazine Newsstand 6.14 is free (with in-app purchases) and available worldwide through the App Store in the News category. 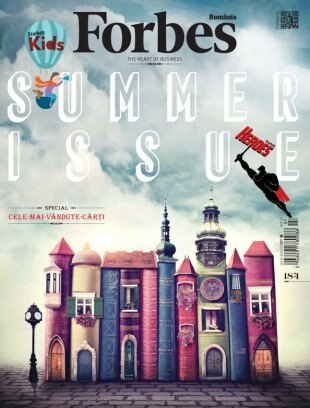 A monthly magazine, Forbes Romania is priced at RON 97.07 ($23.99 USD) for an annual subscription on Magzter. Forbes Romania also comes as a treat to Magzter GOLD users, who can enjoy reading it along with 4,000+ other international digital magazines. The Magzter app is also available on the web, Google Play, Amazon App Store, Kindle Fire and is expanding to more platforms soon. Magzter's easy purchase and renewal systems ensure subscriptions are paid on time, eliminating the need for paper checks and postal mail issues. Users can buy their magazines on any of the above devices/platforms and seamlessly port their purchases to any other devices, a feature unique to Magzter. Magzter is the world's largest and fastest growing global digital magazine newsstand with over 35 million digital consumers, more than 9,200 magazines from over 4,000 publishers. Headquartered in New York, Magzter has its local offices in London, Barcelona, Amsterdam, Mexico City, Cape Town, Chennai, Singapore and Tokyo and will soon be expanding to other countries. Founded by global entrepreneurs, Girish Ramdas and Vijay Radhakrishnan in June 2011, Magzter enables magazine publishers around the world to create and deliver digital editions of their titles to global consumers. Powered by its proprietary OREY Click Publishing System(R), Magzter also enables their customers to publish interactive/audio-visual content in the magazine as it supports HTML5. Magzter launched Magzter GOLD subscription service to give digital readers unlimited access to thousands of magazines for a low monthly price. All Material and Software (C) Copyright 2017 Magzter Inc. All Rights Reserved. Apple, the Apple logo, iPhone, iPod and iPad are registered trademarks of Apple Inc. in the U.S. and/or other countries. Other trademarks and registered trademarks may be the property of their respective owners.